It's a glossy box of remixing tricks and a plug-in controller. An impressive and highly configurable three-in-one effects processor - with a hefty price tag. Lots of fun. Includes plug-in software. Quality of effects. Pioneer is a past master at providing professionally accepted DJ products. Although others dived into the digital DJ ocean first, one could argue that it was with the arrival of the Pioneer CDJ-500 (and then the CDJ-1000) that the transition from vinyl to CD became a reality. Alongside its CDJ range, Pioneer developed effects processors specifically targeted at the live DJ wishing to spice-up their mixes. 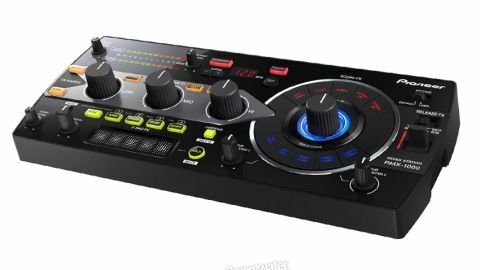 The RMX-1000 is perhaps the natural extension to these earlier units - such as the EFX-1000 it replaces - as it can work in multiple guises: as a standalone hardware effect unit or as a plug-in controller (see the Plug, Play and Edit box) for use with your DAW of choice. Lift the RMX out of the box and you're presented with a fine looking unit, about the size of two CD cases in width, and with enough weight for it not to slide around once you start getting your hands dirty. In terms of connectivity, the back panel provides both 1/4-inch Jack and RCA-Phono I/O. A USB port, power input (for the enclosed mains adaptor), and side-panel SD slot complete the line-up. "The unit features automatic tempo detection, though this can be overridden using the tap-tempo button"
Now to the fun part: the glossy, knob and illuminated button-laden front panel. On that first point - it is very glossy, and although rather fine to look, it did require a little adjustment to avoid glare from the studio windows and lights. Independent controls are provided for setting input and output levels with clear and colourful metering. The unit features automatic tempo detection, though this can be overridden using the tap-tempo button - it's important to get this right, as many of the effect treatments are tempo-synced. A couple of 'nudge' buttons allow you to shift the relative position of these time-based effects if necessary. There are essentially three separate FX sections in the RMX-1000. The Isolate FX at first appears to be a three-band filter section, with the usual Low, Mid and Hi knobs for cutting and boosting as required. Although in Isolator mode this is quite possible, it quickly becomes clear that there's a lot more to the RMX than this. For example, when Cut/Add mode is selected, and the three controls are moved anti-clockwise, you can adjust the cut-off frequency of high and low-pass filters while still keeping the kick drum in the mix, but move them clockwise and an eighth-note delay is applied to the respective band. In fact, the delay time decreases in tempo-divisible increments the further you move each control. This is perhaps the key to the unit's success - it's very easy to dial-in useful, interesting and varied effects with a single flick of the wrist, which on other units would either be complicated or simply impossible. Two further modes take care of combined transform, gating, rolling and overdrive effects - again, selective per band and dynamically variable depending on controller position. Excellent - and very, very easy. Scene FX, based around a single, large rotary encoder, are equally fun to use, with factory presets for Build Up and Break Down sections. For example, BPF Echo applies a bandpass filter to the signal, before passing it on to the delay section - with filter bandwidth under user control. "Most of the effects, and the way the controls respond to them in real-time, can be edited"
Two smaller knobs allow you to change the delay time and filter modulation - though these parameters change per preset. The effects in this section take in filtering, echo, white noise sweeps and reverb, often with a few unusual modulation options thrown in. It's worth pointing out that, while the unit is very capable, even when sticking to the factory presets, most of the effects, and the way the controls respond to them in real-time, can be edited using the included Remixbox software (Plug, Play and Edit box). Additional functionality comes in the form of the X-Pad FX section, which is based around a simple audio sampler. Audio can be 'rolled' (repeated) at different note values depending on where on the pad you place your finger. Movements can be recorded and played ￼back as part of a performance, or used to trigger pre-recorded drum (or other sample) material. In fact, you can program a simple drum beat and mix it into the currently playing track with little effort, making this a great remixing tool. The final element in the RMX's processing quartet is the Release FX section which cuts all direct audio and triggers a vinyl brake, echo trigger or back spin effect - all other effects sections are then switched off ready for you to bring the direct unprocessed track back in. "The use of ready-rolled DJ-effects can be something of a mixed blessing. Over use them and you can quickly fall prey to DJing clichés." Some of these might be a little overblown, but this does provide a great way to jump out of an effects-laden morass in a quite effortless way, which allows you to go a little crazy, knowing you won't have to reset multiple dials in time for the drop. Seems simple, but it's incredibly effective and a lot of fun. The use of ready-rolled DJ-effects can be something of a mixed blessing. Over use them and you can quickly fall prey to DJing clichés, but with thoughtful and relevant application they become the icing on the cake when trying to build up a crowd. The RMX-1000 makes the process easy, and somewhat seamless, though it will perhaps suit some styles more than others. As a controller, when used with its associated plug-in, the package is useful for finessing final mixes as well as deconstructing individual tracks. Our biggest reservation is the price. Despite its flexibility, £599 makes this an expensive item, and certainly not an impulse buy. As a studio tool alone, it might be hard to justify, but if you're a touring and recording DJ/producer, it may well be worth every penny.